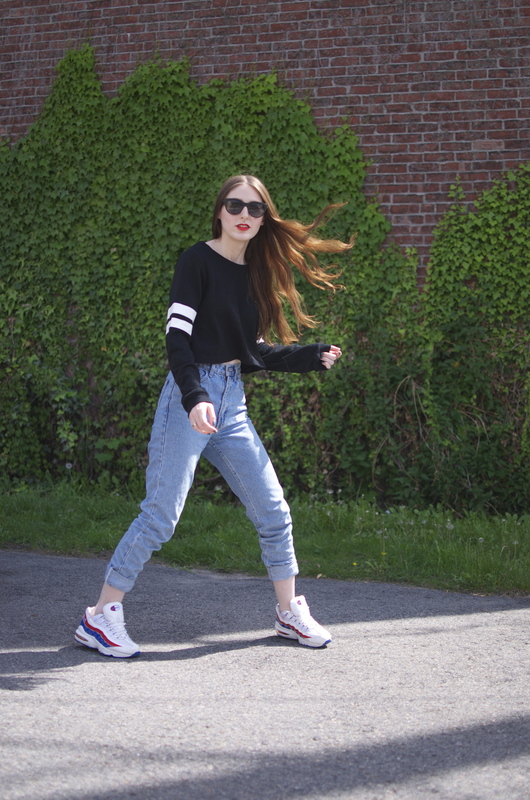 The Hanger ‘Ref’ cropped sweatshirt from Nasty Gal, American Apparel jeans, Nike AirMax ’95 sneakers. Is it the Nikes, or at a whopping five feet and two inches, have I missed out on what could have been an incredible basketball career? The world may never know. What we do know is that sneakers are dominating street-style culture this summer, and that’s cause to jump for joy. Whether you’re toning down a sundress, or turning up the 90s-factor on your mom jeans and crop tops, there’s a sneaker for almost every daytime summer ensemble. And you can’t tell, but the white stripes on this cropped sweatshirt are actually a faux leather material. Way chic.